Do you listen to podcasts? I just love listening to talk radio in the middle of the night. I don’t know when the habit started, but I would reach over, turn the radio on, zone in on the voice talking and most of the time, within minutes, I would be sleeping again. Overall it was a good plan except for one problem. The talking voice coming from the radio wasn’t as conducive to sleep for my wife. Is it any wonder that my wife got me my first iPod and earphone set? I can listen to podcasts any time during the night, and as you can imagine, my wife just LOVES this arrangement so much better. This weekend I listened to “This American Life”, episode 505: Use only as directed. In case you haven’t heard of “This American Life”, it’s a weekly radio show out of Chicago hosted by Ira Glass. The radio program is all about stories. Ira has a gift, the gift of storytelling. As of this writing, “This American Life” is the #1 podcast in the Apple’s iTunes store. In this weeks episode, he tells a story about Tylenol or acetaminophen. 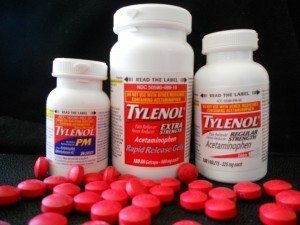 I knew of the adult limit of 4 grams per day; I also knew that Extra strength Tylenol has 650 mg of acetaminophen. I also knew that it was hard on your liver. However, what I didn’t realize was how hard it can be on your system if you take too much of it. But all that said, it is very easy to overdose on acetaminophen. Over 150 people in the United States die on average every year from accidentally taking too much of the drug. 150 people. That data comes from the federal government, from the Centers for Disease Control and Prevention. Federal government data also shows that every year, 78,000 people land in the emergency room and over 33,000 people are hospitalized either from intentional or unintentional overdoses of the drug. Wow, 150 deaths, and 78,000 in the emergency room and 33,000 people hospitalized from misusing the product. Those are the ones that were counted. I wonder how many people just got plain sick, and just rode it out, and never went to the hospital to get checked. So for discussion’s sake, let’s say you have a big toothache, and it’s the middle of the night and you want to get some sleep, you head over to the medicine cabinet to get some relief. Tylenol mathematics done when in big pain. And that’s the problem, the directions say two tabs, but since I’m in so much pain, I’ll take 3. Directions say every six hours, but I’m in big pain, and I don’t remember when I took the last tablets. How many times does 650 mg’s go into 4 grams? Too much math when you’re in pain. The problem is that Tylenol has a very small therapeutic index. In other words, you can be just a little over and it can kill you. The other problem is that acetaminophen is in so many products. For example, You may be taking Tylenol for pain, and in addition, you may be taking some cold medicine that contains acetaminophen, on the side. You have to be careful when taking acetaminophen, there is no safety factor built in. The new upper daily limit for adults, as of this writing, is 3 grams. You need to be careful not to go over. In the only case [ibuprofen] he could find, it took 20 times the recommended dose to kill someone. Same with aspirin. You have to take six or eight times the maximum recommended dose for it to become toxic to your system. With acetaminophen, just twice the maximum safe dose, or even less, taken over several days could possibly get you into serious trouble. I found that interesting, Tylenol is not as safe as other pain medications. You can take 20 times over with some of the other pain medications, but not so with Tylenol. If you go over by a factor of 2, you can be in trouble. So, if you decide to take Tylenol be sure and use only as directed. At our dental office, there are situations where we remove baby teeth. In the past I would recommend to the mothers that if the child was having some discomfort, to use some over the counter medication for pain, such as Tylenol. I think I need to rethink that suggestion. I think there are numerous situations where the child might be better off to just carry on as usual. If I do recommend Tylenol, I will be instructing the mother to use only as directed. If you have some questions or concerns we can be reached here at Seasons of Smiles Dental at (207) 236-4740. As a patient suffering from Osteo. Arthritis and taking an NSAD ‘ celebrex at 300 mg / day I started using ‘ Tylenol for Arthritis ‘ this summer to help relieve pain symptoms for a torn rotator for which I will receive surgery in 2 weeks . I previously had postponed the procedure from may 7 th. of this year I hopes of enjoying the summer months and a little golfing and boating . About 5- 6 weeks ago I was having more pain and took the max. dosage for a couple of days only and started to develop a bod case of ‘ hives ‘ . I did some self testing and after ‘ trial & error ‘ and Googleing ” Tylenol ” web site was surprised to see a warning for side effects and possibly more for people with ‘ liver ‘ problems . I have always had higher than normal liver enzyme levels and brought this to the attention of my doctor who didn’t seem too concerned . In the meantime I developed a serious issue with ear infections and have been treated by a specialist using ‘ locacorten ‘ drops and having the specialist vacuum out the infection twice over the past month . Are these issues connected in some way to the ‘ Tylenol ‘ ? Will be reviewing this Tylenol issue with my doctor this week on my next visit . After listening to the podcast # 505 I am convinced that I am one of the lucky ones who have avoided death due to liver damage and am probably a person who has a low tolerance for low dosage of ” acetaminophen ” Thanks for the Warning and Clarification .